13th/14th Century Book Painting, Medieval Illuminations, Books of Hours, Psalters. God as architect of the world. the Middle Ages, please see: Medieval Art (c.450-1450). (c.1345, Metropolitan Museum, New York. Duke of Normandy, later king of France. If we compare a twelfth-century manuscript like the third Life of St Amand with a mid-thirteenth-century book such as the Psalter of St Louis, we can see that a huge change has taken place in the style of medieval painting during the first half of the thirteenth century. The complete change in attitude cannot be traced along one simple route. Before one can assess the new Gothic style of painting in its entirety, half a century of complex ideas and contradictions must be disentangled. To some extent the decline of Romanesque painting and the emergence of the new style of Gothic art is due in France, as in England, to fresh contact with Byzantine art, either via Sicily or from Constantinople itself. A new naturalism is particularly noticeable in a book such as the Souvigny Bible (Paris, Bibliotheque Nationale), where the scenes are permeated with a new sense of form and composition. The question about where this new movement first appeared is complicated by the fact that a group of books which were probably written in France during the exile of St Thomas Becket was given to Canterbury. 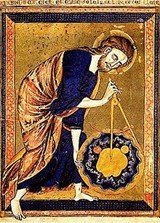 A monk of Canterbury, Manerius, was the scribe of a three-volumed Bible (Paris, Bibliotheque Ste Genevieve). The Bible of St Andre au Bois (Boulogne, Bibliotheque Municipale) has initials filled with fighting men of extraordinary violence. These two books along with several others can all be grouped together because of the style of their initials. All are decorated with thick acanthus foliage emerging from an ordered pattern of stems, and all have powerful colouring. In these early transitional books the importance of Mosan metalwork must again be stressed. Many of the small works of bronze sculpture of the second half of the twelfth century have remarkably naturalistic draperies with the fabric drawn back from the knees in a series of parallel folds. The panels on the Klosterneuburg Altarpiece, made in 1181 by Nicholas of Verdun - the leading exponent of Mosan art - have figures of a style closely reflected in a book such as the Ingeborg Psalter (Chantilly, Musee Conde). This Psalter was written for the Danish queen of Philip Augustus, King of France, and was probably made c.1200. The paintings have taken on the metallic quality of their prototypes and the draperies have the swinging, horizontal folds of the work of Nicholas of Verdun. This style occurs again in another medium in some of the stone sculpture at Reims Cathedral. The sketchbook of Villard d'Honnecourt does not fit easily into an introduction to illuminated manuscripts, but even so it is worth mentioning. Architectural designs must have been carried from one centre to another in pattern books. Unfortunately, these were not considered as items of importance and were destroyed by later generations. However, the sketchbook of Villard has survived and tells us a great deal about the spread of artistic ideas. He drew buttresses, rose windows, and ground plans primarily from the point of view of an architect. But it is most likely that painters also used sketchbooks, and in any case, we eventually find that Medieval artists, masons and metalworkers all shared the same basic repertory of forms. Quite apart from drawing, the new style was considerably influenced by the art of stained glass. Although Romanesque art paid great attention to stained glass, the area devoted to it in Romanesque churches was comparatively small, and decoration principally took the form of mural painting, to which large areas could be devoted. But as Gothic architecture perfected the technique of stone vaulting it was able to lighten the load with the use of flying buttresses and make far larger window openings. These were filled with stained glass. This new medium allowed great scope for pictorial artists, who, in their turn, influenced the making of illuminated manuscripts, in both composition and colour. NOTE: For details of the oldest known illuminated Biblical text, see: the Garima Gospels (390-660) from Ethiopia's Abba Garima Monastery. It is no accident that this new style of Christian art was born in France. The University of Paris was the intellectual centre of Europe throughout the thirteenth century, and from the time of St Louis (1226-70) the French court became increasingly important. Students and scholars from all over the continent flocked to Paris to learn and to discuss scholarly matters. Knights returning from the Crusades introduced Eastern theory and science. With the ascendancy of the university, the importance of monasteries as centres of book illustration and illumination declined. Commercial guilds were founded and books were produced for private ownership. Large ceremonial books, lavishly illuminated and ornamented with jewellery, became less common and we must follow the stylistic developments principally in Psalters, which the highborn laity made their own. Eventually the Psalter gave way to even smaller Books of Hours, but the former was more popular during the thirteenth century. NOTE: Patterns and motifs used in Gothic illuminations and illustrations had a strong influence on the decorative features used in Flamboyant Gothic architecture (1375-1500). The development in French painting during the first half of the century can be followed in a succession of Psalters written for the royal house at Paris. The first of this group has already been mentioned; it is the Ingeborg Psalter (Musee Conde, Chantilly) written for the queen of Philip Augustus. Secondly, there is the Psalter of Blanche of Castile, a book probably brought from York by her husband Louis. It seems unlikely that either of these books was written in Paris; the Ingeborg Psalter has distinctly Mosan characteristics and that of Blanche of Castile has many English features. In contrast, a Psalter written c.1230, for the Norwegian princess, Christine, seems to have been written in Paris. Originating in Paris at the same date is another Psalter that has always been connected with the name of Blanche of Castile (Paris, Bibliotheque de l'Arsenal). It shows scenes enclosed in medallions, interlocking like panels of stained glass. A reminder of the Ingeborg style persists in the sculptural folds of the Madonna's drapery, but this mannerism is abandoned in the smaller figures. Rich, fleshy acanthus foliage in the border is still reminiscent of late-twelfth-century Bibles, with its curled edges and the curious method of indicating a fold in the leaf by a series of white dots. Any elements of Romanesque art are entirely absent in a Psalter written c.1250 (Paris, Bibliotheque Nationale). Here the scenes, set beneath trilobate architraves, are richly coloured. The figures, set against a ground of patterned gold, are treated with a new simplicity; drapery conventions give way to a new interest in soft vertical folds and uncluttered outlines. These last two Psalters set the stage for the most lavish psalter of them all: the Psalter of St Louis (Paris, Bibliotheque Nationale). This exquisite work of Biblical art, was made between 1253 and the king's death in 1270. It has seventy-eight full-page illustrations of scenes from the Old Testament. The book is closely connected with St Louis' other artistic activities, as the architecture it features is an exact copy of Sainte Chapelle (1241-48), built by his architect Pierre de Montreuil. Painted in rich colour, the figures are set against a background of shimmering gold that seems to bathe them in glorious sunlight. They are extremely elegant in design with small heads and tall thin bodies that move with an easy grace. This is above all an 'edition de luxe', adjudged worthy of the great king. The typology of the Bible Moralisee was a product of the thirteenth-century Dominican scholar Hugh of St Cher. It contains scenes from the Bible juxtaposed with scenes of moral significance. Several copies of this great work were made, the most important being the Bible Moralisee de St Louis (Paris, Bibliotheque Nationale, London, British Museum, and Oxford, Bodleian). In this the texts are supported by the use of illustrations and each biblical event is shown with its moralizing counterpart. The pages seem like stained glass transposed onto parchment. Each folio has medallions arranged in vertical rows of four with intervening strips of text replacing the mullions of the windows. The colour has a luminosity normally associated with stained glass and the figure painting is characterized by strong outlines that remind us of the leads. Sometimes the actual quality varies but the artists must be to some degree excused as the whole book contained over five thousand medallions. Towards the end of the thirteenth century, we see the emergence of the manuscript illuminator as a distinct artistic personality. More than one reference is made to a Master Honore of the Rue Boutebrie in Paris. His name occurs in the accounts books of the king and in one manuscript, Decretals of Gratian (Tours, Bibliotheque Municipale). On the basis of stylistic comparison other books can be attributed to Master Honore, notably the Breviary of Philip the Fair (Paris, Bibliotheque Nationale). Certainly another book written for the royal house, this contains historiated initials and one full-page illustration of scenes from the Life of David. The narrative is easy to follow, with the names of the principal characters written below the figures. This work marks the culmination of the trends embarked upon during the earlier part of the century. The scenes are full of life and the movement of the figures is clearly shown beneath the draperies. The artist still retains the patterned backgrounds, but in the lower scene he has introduced elements of landscape painting, such as hills scattered with trees to suggest a naturalistic setting. Jean Pucelle (c.1290-1334), who worked in Paris during the second quarter of the fourteenth century, was another professional illuminator like Master Honore. Pucelle was undoubtedly the artist of the Belleville Breviary (1326) and the Billyng Bible (both in the Bibliotheque Nationale, Paris), and his hand can also be traced in several other Books of Hours, notably his masterpiece the Hours of Jeanne d'Evreux (1324-28, The Cloisters, Metropolitan Museum of Art, New York). This artist used the marginal decorations that were so popular in the north of France and in England, filling margins with rustic scenes borrowed from everyday life. Butterflies and snails cling to ripening tendrils of peas, and dragonflies glide among the foliage while the farmer gathers the harvest. His interest in naturalism is exemplified in the Labours of the Months where the usual scenes, chopping wood or sowing crops, are replaced by a tree whose branches show the change in foliage at different times of the year. Although the successor of Master Honore, and essentially a Parisian artist, Jean Pucelle is important because he also shows a knowledge of the Italian Sienese School of painting, an important focus of trecento art. The Papal court moved from Rome to Avignon in 1309, and the great Sienese artist, Simone Martini (1285-1344), was working there in the latter part of his life. Despite a somewhat superficial understanding of the Italian manner, Pucelle could not yet grasp linear perspective and the plastic treatment of volumes and space. For a full mastery of these lessons from Italy, we must wait for another generation, whose achievements are generally referred to under the heading of the International Gothic Style of art. They included artists like Jacquemart de Hesdin (c.1355-1414) and the trio known as the Limbourg Brothers (all died 1416), as well as the Provencal creator of the wonderful Avignon Pieta (1454-6) - Enguerrand de Quarton (c.1410-1466). In our article on Romanesque book painting, we noted the signs of a change evidenced by the Winchester Bible (c.1170), but there is no particular work produced in the next fifty years which can be called a truly Gothic manuscript. The period of transition is a protracted process of experiment and change. The close stylistic similarities between manuscripts written in France and in England have already been mentioned. Their destination can often be determined by the inclusion or exclusion of particular saints in the Calendar, but usually even this does not tell us much about the nationality of the artist, as there were certainly French artists working in English scriptoria and Englishmen working in France. The Paris copy of the Utrecht Psalter seems to be a case in point. For more about earlier English and Irish illuminations in the Insular Style, see: Book of Durrow (c.680), Lindisfarne Gospels (c.700), Echternach Gospels (c.700), Lichfield Gospels (c.730) and Book of Kells (c.800), in particular, its Monogram Page (Chi/Rho). At the close of the twelfth century, the fashion for great Bibles destined for ceremonial use gives way to smaller works for theological study and Psalters for the private devotions of lay people. With the change in scale of the books, the quality of the religious art in them tended to become more delicate and minute, paving the way for the miniature painting of the International Gothic. However, monastic scriptoria survived longer in England than in France and there was major activity at St Albans and Winchester at least until the middle of the thirteenth century. The transitional period is well illustrated in a work such as the Huntingfield Psalter (New York, Pierpont Morgan Library). A book which shows rather similar trends is the Psalter at Imola. The beginning of the first Psalm is shown on a two-page opening with the initial 'B' of 'Beatus' facing a decorated page with the first verse of the Psalm. The 'B' contains the Dream of Jesse. A calm, balanced orderliness pervades the illustration, with kings and prophets ranged symmetrically at the interstices of the initial and the border enriched by stories from the Life of David. The arrangement of the text on a coloured ground was very popular at this date and has a sober beauty. The De Bello Bible (London, British Museum) was written for Robert de Bello, Abbot of Canterbury from 1224 to 1253. It is larger than most books of this date and has a large initial at the beginning of the Book of Genesis filled with scenes from the Creation. To make room for scenes of the Original Sin, the initial T has been extended along the bottom into an 'L' shape, allowing room for only one column of text. Each scene is contained within a medallion as in the contemporary French books, but the foliate projections from the edge of the initial are a new feature and will be taken to far greater lengths in later books. Some of the best books of the second quarter of this century are associated with the shadowy figure of W de Brailes. Only the artist's name is known. Where he came from, whether he was a monastic or secular ecclesiastic, a travelling artist or based in one scriptorium, are questions to which answers can be only speculative. His name occurs in two manuscripts and several others are attributed on stylistic grounds. W. de Brailes has all the abilities of a good story-teller. He is able to translate the ideas of his vivid imagination into lively painted stories. Having a remarkable knowledge of the details of biblical events he did not hesitate to put it to work in his illuminations. The leaves of a Psalter (Cambridge, Fitzwilliam Museum) contain one instance of W de Brailes' autograph; it is charmingly shown on a little figure singled out from the Damned in the Last Judgement, apparently in hope of having his labours rewarded by Salvation. A far more tangible personality is Matthew Paris. Born c.1200, Paris entered the Monastery of St Albans in 1217, and is known to have had contact with the king and other noblemen. In 1235, he was appointed historiographer to the Abbey of St Albans and composed two chronicles now divided between the British Museum and Corpus Christi College, Cambridge. One of the separate pages which are bound into the Chronicles has a drawing of the Madonna and Child. This famous leaf, showing Paris himself prostrated at the feet of the Madonna, is a monumental work of art. Paris' qualities as a draughtsman are amply displayed, giving the figure drawing a firm, expressive form. The figures have a regal poise but come to life with the lively handling of the draperies, tinted with pale washes of colour. The text of the Chronicle is richly illustrated with relevant scenes sketched in the margins and at the foot of the pages, giving us an instructive account of historical events between 1230 and 1251. Not all the illustrations, in a work of such magnitude, are by the Master himself, but a consistency of subject-matter suggests that Matthew Paris was responsible for the design of the whole series. As patronage changed, the choice of subjects also changed. Representations of the Madonna and Child are comparatively rare in Romanesque books, but with the rise of a gentler, more human approach, paintings of the Virgin and Child are included in many Gothic Psalters. The Matthew Paris drawing has already been mentioned. A touching example also occurs in the Amesbury Psalter (Oxford, All Souls College) where a nun, probably the owner of the book, is seen at the feet of the Madonna who suckles her Child. The nun appears again at the feet of Christ in Majesty, where the setting is arranged with elaborate architectural details. The Amesbury Psalter sums up the achievements of the mid-thirteenth century. A skilful choice of rich colours reverberates against a golden background, elegant willowy figures sway in delicate curves, and yet the draperies retain a nervous energy that suggests intense devotion. In general, the illumination of the latter half of the thirteenth century reaffirms its connections with France. This is particularly evident in a book like the Tenison Psalter (London, British Museum) which was intended for no less a person than a son of King Edward I. The illustrations are of minute proportions set inside a large area of patterned background, and the scenes have become exquisitely elegant. The margins of the pages are decorated with a border containing birds and animals and strange little grotesques as well as scenes from everyday life. Margin decorations were to become one of the hallmarks of the East Anglian school. From about 1300, for reasons that are not at all easy to understand, the school of East Anglia became increasingly important and it is in this area that we can trace the important stylistic developments of the next thirty or forty years. From a group of Psalters of very high quality, the Ormesby Psalter (Oxford, Bodleian) and the Gorleston Psalter (London, British Museum) can be singled out. Here the traditional biblical scenes are arranged alongside all kinds of fantastic and secular images. The margins are filled with butterflies and ladybirds, with centaurs and dragons, monkeys and men. Babewyn is the name given to these marginalia and, although in its strictest sense it derives from the Italian word for baboon, it is now given to all kinds of grotesques. Gradually this emphasis on margin decoration begins to outweigh the narrative content of the Psalters. For example, in the Gorleston Psalter, which is a few years later than the Ormesby Psalter, preoccupation with the secular decoration becomes paramount. The style of this work is more humorous and even satirical - the artists show rabbits conducting a funeral! This is a far cry from the twelfth-century bestiaries intended for instruction. These marginalia were popular on both sides of the Channel and abound in manuscripts of this date from north-eastern France and the Low Countries, but the more serious features of these books are also worthy of comment. We have seen that in France Jean Pucelle showed some knowledge of the great pictorial developments in Italy at a surprisingly early date. The speed with which artistic influence spread from one country to another should not be underestimated, for a parallel knowledge of Italian Proto-Renaissance art appears in England at this time. There is no certain evidence that Italians were working in England, but if one examines the paintings it becomes clear that English artists must have known the works of the great Italian masters, like Cimabue (Cenni di Peppi) (1240-1302), Duccio di Buoninsegna (c.1255-1319) and Giotto (1267-1337). The Ormesby Psalter was substantially complete before 1325 but some additions were made at about this date, and it is here that the Italian influence is apparent. A real attempt is made to gain depth in the picture plane and the figures are given a certain weight. This Italianism is even more noticeable in slightly later books like the Douai Psalter (now badly damaged) and the Psalter of St Omer (London, British Museum). The artists of these books interpreted the Italian treatment of drapery forms in much the same way as did Jean Pucelle, using heavy swinging folds of soft materials. The Psalter of Robert de Lisle (London, British Museum) is particularly interesting as it shows the later stage of the East Anglian school as well as the style of some twenty-five years earlier. In the later illustrations of this book the artist, beginning to understand perspective, is able to crowd his figures in a group fairly satisfactorily. However, this particular phase of Italian influence was inconclusive in England. In the Luttrell Psalter written in East Anglia c 1340, for Sir Geoffrey Luttrell of Irnham in Lincolnshire, already we see it fading. Figures become flatter again and are described by linear rhythms. The Luttrell Psalter is not unfairly described as the show-piece of the East Anglian school in its decadence. The fresh originality gives way to a harder, more mechanical technique, but this book contains a celebrated series of farmers at work, scenes full of interest for the social historian even though the actual handling is coarse and rather heavy. Queen Mary's Psalter (London, British Museum) is one of the finest English Gothic manuscripts. Although not a product of the East Anglian school, the artist owes something to their example. It is prefaced by sixty-six scenes from the Old Testament, and has other full-page illustrations and countless margin decorations of the highest quality. If, as seems probable, this book is the work of one artist alone, then it is even more remarkable. Its characteristics are those of the English school - fine outline drawings and thin washes of delicate colour. The Black Death (1348-1349) was probably responsible for the somewhat meagre output of English manuscripts between c 1350 and 1370. However, there was no complete break and a small number of manuscripts helped to fill the gap. The most interesting of these is the Egerton Genesis (London, British Museum) which perhaps shows the one and only English episode in the history of illuminated manuscripts where the artist made any serious attempt to come to terms with the deeper significance of Renaissance art that was beginning to appear in Italy. The actual subject-matter of this book has no English prototypes and although the illustrations are drawn in characteristic English outlines, the style must be partially derived from Italy. The hand of the master of the Egerton Genesis can be seen in two pages of the Fitzwarin Hours (Paris, Bibliotheque Nationale), although the rest of the book is far more English in character. The most striking feature of the Fitzwarin Hours is the introduction of fantastic pinnacles in the architectural settings and in the framework of the miniatures. These same fantasies of architecture, structures that could never have been built, form the link with an important group of books written for Humphrey de Bohun, Earl of Leicester. His death is recorded in 1373, providing an approximate date for the group, but his family continued the patronage. The Psalter in Brescia may be loosely connected with this group of works. English tradition survives strongly in the lay-out of the page, but the extraneous animals and grotesques are far less prominent. By now we begin to see a reaffirmation of the influence of France. During the next decade other new ideas are introduced into English miniature, and manuscripts in England, as elsewhere, form a part of the European International Style. Like earlier German Medieval art, the development of German Gothic art was not centralized as it was in France. There was no stabilizing influence comparable to the royal house in Paris, and monastic scriptoria survived far longer. In this atmosphere, different parts of the country continued to develop their own individual ideas. If only for this reason, it seems more profitable, in discussing Gothic painting in this region, to disregard the present-day boundaries of Germany and to consider Central European painting as a whole. Manuscripts of the first half of the thirteenth century in Germany present a special problem for classification. Are they Romanesque or Gothic? On balance they should be grouped with the Gothic works, as they present another aspect of the importance of Byzantium in the formation of the new style. The Berthold Missal (New York, Pierpont Morgan Library) from Weingarten, was written soon after 1200 and clearly shows fresh ideas. Instead of the habitual line-drawings of the late twelfth century, we have paintings in rich, strong colours. The debt to Byzantine examples is paramount, and a competent narrative ability is combined with a good sense of composition. The figures are given the qualities of German Gothic sculpture, and again one is reminded of the art of metalwork. One of the striking features of this second wave of influence from the East is that it soon becomes submerged beneath the national characteristics of the artists. This is particularly noticeable in the Landgraf Hermann Psalters written for Landgraf Hermann of Thuringia during the first decades of the thirteenth century. Among these is the Psalter of St Elizabeth now at Cividale. This is a sumptuous book illustrated in rich reds, blues and golds, containing isolated events from the Old Testament as well as scenes from the Life of Christ. Again, elements of Christian Byzantine art are clearly apparent in the faces and in the weightiness of the figures, but the draperies are sharp and angular, broken up into a series of jagged, horizontal folds. This particular mannerism seems to have originated in the north of Germany, but it soon spread south and east to Bavaria, Austria and Bohemia. 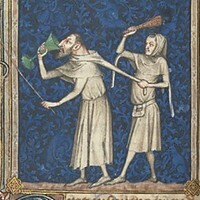 It became more and more exaggerated as we see in a Psalter from the Tyrol (New York, Pierpont Morgan Library). Later this feature governs the whole spirit of the illuminations and lends the paintings a nervous, excited expressionism that reminds us of those great Evangelist portraits of Ottonian art. It reaches its climax in books like the Mainz Gospels (Munich, Staatsbibliothek) and the Bonmont Psalter (Besancon, Bibliotheque Municipale), in a style that arguably heralds the expressionistic idiom of the German Renaissance of the fifteenth century. More immediately, however, it is in works such as these that we also see the first signs of influence from France. The Bonmont Psalter has purely French initials with Gothic foliage. How the French style came to Germany at this date, c.1250, is difficult to assess, but it must be attributed partly to the monastic orders of the Cistercians and Dominicans. Gradually it spread eastwards and reached Bohemia before 1300. Small Books of Hours never really came into fashion in Germany, so there are rarely direct copies of subject-matter from French books. It is in legal textbooks, chronicles and secular works that we first see the influence of the French style. One of the finest secular books of the Middle Ages is the Minnesanger Manuscript of the Manesse family (Heidelberg, University Library). This is a collection of paintings of poets, lovers and troubadours made for Rudger Manesse von Maneck of Zurich, who died in 1304, and it was completed by his son Johannes. Among the subjects we find King Wenzel of Bohemia (1278-1305), the poet Wolfram von Eschenbach (1170-1220) and Heinrich Frauenlob conducting his orchestra. Suddenly we have emerged into a new world of decorative art full of delicate courtly detail. Careful attention is paid to details of costume; a cape of ermine is draped over the shoulders of the conductor and fur trimmings edge the coat of the central musician. The whole book is filled with lively, topical narrative and is a supremely decorative work of art. A copy of Wolfram von Eschenbach's poem, Willehalm von Oranse, was made in 1334 for Landgraf Henry II, and used to be one of the treasured possessions of the library at Cassel. The manuscript was tragically lost during the Second World War, but photographs survive to bear witness to its beauty. Artistically the paintings were of a higher quality than the Minnesanger manuscript and revealed an artist of great stature. He probably came from Cologne, and his hand can be seen again in the Gradual of Wettingen (Aarau, Kantonsbibliothek) where the elegant figures seem to be weighed down with heavy, flowing draperies. One wonders if the artist knew the work of Jean Pucelle. Before the accession of the Luxembourg dynasty (1311), the native art of Bohemia clearly shows the different foreign influences from which it draws its inspiration. From the north we see the typical agitated draperies of the Saxon-Thuringian school, from Venice in the south come strong traces of Byzantium and of Italy, and from the west comes French influence that added refinement to the whole. After the accession of John of Luxembourg, these latter influences become more prominent. Commissions from the royal house at Prague in the early fourteenth century include books modelled on Franciscan manuscripts, and it is these works which initiate the fine tradition of Bohemian manuscript illumination that continues into the International Gothic period of the early fifteenth century. The Passional of Abbess Kunigunda (Prague, University Library) was written for Kunigunda, daughter of the King of Bohemia. The princess died in 1321 and the book must have been written and illustrated before this date. The Passional is unfinished, but the illustrations are of the finest quality. They include the moving scene of Christ taking leave of His Mother. Intense, deep emotion binds the two together and seems to exclude the onlooker. The group is enclosed in a single outline and the vertical lines of the drapery lead the eye towards the two expressive heads. Stylistically the painting reflects something of the art of France, an influence to be seen again in the Velislav Bible (Prague, National Library) which was illustrated some twenty years later. The typology of this Picture Bible is based on books of the Fransciscan order; it is a comparatively large book with over seven hundred illustrations accompanied by an explanatory text. It was made for Velislav, who was later to become Chancellor to Emperor Charles IV. The linear qualities of the Passional are developed further in this manuscript, where the scenes are drawn in pen and ink and are only slightly coloured. In 1348, Charles IV founded the great University of Prague and thus opened the gates of Bohemia to foreign artists and craftsmen who flocked to Prague. It was in this international atmosphere that the new unified style was to be created. At a time when Matthew Paris and Master Honore were distinguishing the art of manuscript illumination in England and France, illuminators in Italy were still struggling for an individual style. Today, Italian manuscript illumination of the late thirteenth century is still regarded as an essentially minor art, totally overshadowed by the achievements of Cimabue, Duccio and Giotto. This fact is in itself significant, and it is important to bear in mind that in Italy new artistic developments invariably derived from panel-paintings and from mural fresco painting, whereas in northern Europe the first advances came via illuminated books. Bologna is one of the oldest and most celebrated university cities, and it is here that we find the first centre of Gothic book decoration. A real workshop seems to have existed here, producing not only secular textbooks and books for theological instruction, but also service books for ecclesiastical foundations. Legal codices were numerous; a good example can be seen in the illustrated Book of Civil Law (Turin, Biblioteca Nazionale) which contains scenes in brilliant colours. In an illustration which shows Justice at work, the figures are handled with a strong suggestion of plastic art, no doubt due to the omnipresent influence of Giotto, and the scenes are endowed with a vibrant vitality. The Bologna school of book painting - not to be confused with the Baroque , Bolognese School established by Annibale Carracci - with its firm construction of figures and sober use of decoration, finds its greatest exponent in Niccolo da Giacomo. This artist, working during the second half of the fourteenth century, was head of a large workshop and a number of manuscripts contain his signature. Niccolo da Giacomo was a highly gifted individualist. The copy of Lucan's Pharsalia (Milan, Biblioteca Trivulziana) is typical of his best work and shows many of his characteristic traits. No ideal beauty restrains him; the faces have curiously livid complexions; gaudy colours and a showy superficiality emphasize the secular character of the master. Florence, more than any other city, shows the subordination of manuscript illumination to the more monumental forms of art. Reflections of the paintings of Cimabue can be seen in the large Choir Books of San Marco, and Pacino da Buonaguida based both his iconography and his style on that of Giotto. His works are crude and rather heavy, almost as if he was unwilling to reduce the scale of his prototypes to the minute decorations of books. The Biadaiolo (Florence, Biblioteca Laurenziana) is a sort of 'mirror of life' and contains scenes relating to everyday events. It was composed by a Florentine grain-merchant as a kind of diary.The tale is simply told with a few figures; it is colourful and essentially a popular manuscript, yet a masterpiece in its own way. Early Gothic manuscripts of Siena show connections with the scriptoria of Bologna, but the style is modified under the influence of the great Duccio. The finest illuminator of the Sienese School was undoubtedly Simone Martini. Only one page remains to bear witness to his skill as an illuminator. This is the frontispiece to a copy of Virgil that belonged to Petrarch (Milan, Biblioteca Ambrosiana). Simone made friends with Petrarch during his prolonged sojourn at Avignon and no doubt the humanistic character of the illustration is due to Petrarch's own instructions. The style of the painting shows a wonderful fusion of the linear rythmns that Simone had learnt in France and the brilliant colours of Italy's Byzantine tradition. In some ways, Simone was really an artist ahead of his time. He died at Avignon in 1344, and his immediate influence is hard to assess, but the art of Simone was certainly a moving force in the formation of the International Style a generation later, and it was at that time that the Sienese regarded him as their greatest artist. In Venice and Milan the most important manuscripts do not appear until the closing stages of the fourteenth century, and we will discuss these in our next article on the International Gothic Style. Gothic illuminated texts can be seen in some of the best art museums in the world, notably the Musee Conde, Chantilly, the British Museum and the Metropolitan Museum of Art, New York.  For the chronology of Gothic painting, see: History of Art Timeline.  For information about Gothic illuminations, see: Homepage.